You can’t ask for much more in a power transformer than you get with the AVR20. Besides protecting valuable equipment from voltage spikes and power surges or sags,the AVR20 offers worthwhile improvements in sound quality, by removing noise from the audio signal, by providing the preamp and amp with clean AC power. Great product, recommended. 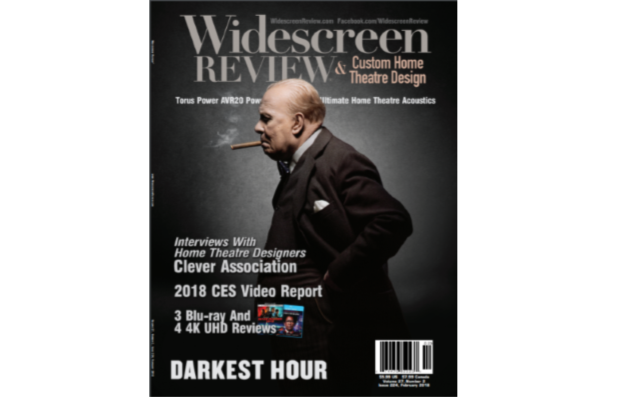 by Doug Blackburn for Widescreen Review – The last Torus Power power transformer I reviewed was in the spring of 2011, a 15-Amp model with automatic voltage regulation. This latest model adds features not available in 2011, but it does retain the automatic voltage regulation feature present in the previous review unit. Torus does make models without automatic voltage regulation that are recommended for applications where the AC power is stable or has only small voltage variations. Keep in mind that the filtering done in Torus Power products is mostly done by a complex and large Plitron toroidal transformer. In fact, Torus Power was originally owned by Plitron, but as of February 1, 2016, Torus Power became an independent company. These special transformers isolate connected devices from the power line, produce balanced output power to remove common mode noise from the AC power, reduce differential noise significantly, and AVR models (automatic voltage regulation) will automatically maintain the output voltage between 115 VAC and 125 VAC even if the AC voltage is varying between 90 VAC and 130 VAC.Voltage regulation is done by using a more complex transformer and a circuit board with relays switching the active transformer windings that keep the output voltage within that 115 to 125 range. The sophisticated transformer can’t stop voltage spikes like those from lightning, so there is a circuit board in these Power Transformers that contains the surge protection devices. Torus Power also designs-in a power reservoir that can be drawn on instantaneously to provide a considerable amount of extra current for brief peaks. In addition, the AVR20 can turn itself off if the power line drops too low or goes too high. The number of “families” of power conditioning devices Torus Power manufactures is surprising, but within those families of models there can be lots of additional models needed because of global electrical issues like differences in voltage, 50 Hz versus 60 Hz, and differences in electrical plugs. The compact TOT series has two models with many variants for global use. The RM series has been in production for quite a while now and offers power conditioning with-out automatic voltage regulation. The RM series includes models that provide as little as 5 Amps of conditioned power to as much as 100Amps of conditioned power. Since the RM series is fairly “basic,” they do not have Ethernet (browser interface for monitoring) or automatic voltage regulation. The AVR2 series has the most features packed into each model, adding features not present in the AVR series. The AVR2 series allows turning single power outlets on and off or groups of outlets on and off together, among other advanced features. The AVR series encompasses the automatic voltage regulation models, including the AVR20 reviewed here. There are eight models in the AVR series from 15 Amps to 90 Amps. Three of these models operate on single-phase 120 VAC power and five of these models operate on a balanced 240 VAC input with balanced 120VAC as the output voltage. This can boost performance of amplifiers with analog power supplies enough to consider wiring your home theatre room for both 120 and 240 VAC, so you can use a 240 VAC power transformer to operate the amplifiers. 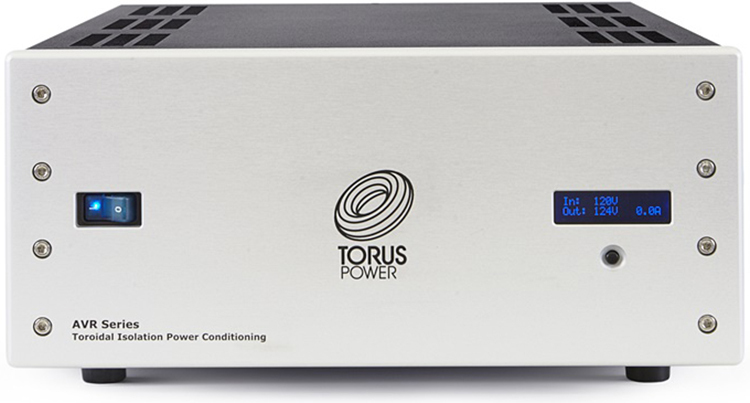 Torus will even provide you with a power transformer with 240 VAC input and 240 VAC output should you wish to take advantage of another potential performance booster for your amplifiers. “Analog” power supplies in solid-state amplifiers with conventional power supplies (vs. various types of switching power supply) are designed with a specific power supply voltage. Most amplifiers used for home theatre have a power supply voltage of 80 volts to 100 volts. Note that 120 VAC power ranges from roughly +172 volts to -172 volts. If the amplifier power supply operates at 100 volts, you cannot recharge the power supply until the voltage on the power line is over 100 volts. That means only the portion of the AC sine wave with values from 100.1 volts to 172 volts can recharge the amplifier power supply. When you use an amplifier intended for use with 240 VAC power, the power supply voltage will still be 100 volts, but the power line voltage now ranges from some-thing like +300 volts to -300 volts, so all the time the AC sine wave is above +100 volts or below -100 volts, the power supply can recharge. With 240 VAC input power you have about 200 volts avail-able to recharge the power supply every half-cycle instead of about72 volts if you were using 120 VAC for input power. This performance bump from having a higher input voltage is real, and those considering updating amplifiers may want to consider getting 240 VAC versions of the amp(s) and have wiring run into your theatre room tos support 240 VAC for the power amplifiers. We are not nearly done going through Torus Power products… so we know there are eight AVR models for North America, but how many more for the rest of the world? I counted 32. So 40 models total in the AVR series alone! Large wall-mount units often installed near the electrical panel are available with output capacity of 45, 60, 75,or 100 Amps. There are two models of “in floor” models with 25,000kVA or 35,000 kVA output capacity. And there are six models called All-in-One that combine an electrical panel with 24 circuit breakers on top with Torus Power power conditioning in a separate compartment below the breaker panel. The number of models that Torus Power produces to support the world with Power Transformers is pretty staggering, certainly more than 100 variants, and probably several hundred variants of each model family when you consider all the possible configurations. In many cases, the only difference between some of these models will be the types of power plug installed on the back, but different models also support different input and output voltages as well as having higher or lower total current capacity. Using a power transformer is about as easy as it gets. Put it in a rack, plug it in, plug in every component in your system, turn on the power transformer, turn on your system, and that’s all there is to it. You can, with the AVR series, and more so with the AVR2 series, get into a lot more setup and monitoring options than you’ve had from Power Transformers in the past. You don’t have to use the advanced features, but they are there and you may as well make use of them—you paid for them after all. The only perceived improvement in performance of the system that I observed while using the AVR20 was the improved clarity of audio. As improvements go, it’s easy to hear on a good system you are familiar with, but with an unfamiliar system you might not notice much. The improvement in audio clarity is the sort of thing that you could miss if you weren’t sure what to expect. Generally, you will hear more pristine sound and what is sometimes referred to as get-ting blacker-blacks, a reference to the silence between and around notes being more silent than you have heard before. This lets you hear everything just a little better. Details come into better focus, and it’s easier to isolate a single instrument in a large ensemble because the clarity around each instrument lets you find each and every instrument, one at a time, within the space captured in the recording. Have you ever been in a situation where there was some noise in the background, but you didn’t notice it until the noise stopped? That’s sort of what you experience with power conditioning. When you are used to no power conditioning and you add power conditioning, you realize that the system does indeed sound better, but you’d never noticed the sound was a bit opaque before. In general, I hear detail in music with more clarity with power conditioning. There isn’t more detail, it’s just easier to hear the detail and some low-level details obscured by background noise before you had power conditioning now reveal themselves. The background noise floor is lowered by the balanced power output, cancelling out noise common to both input power lines as well as from removing differential noise on a single AC power input line. It’s not a wildly obvious improvement, but its very revealing of how you may have problems solved you didn’t even know you had. Movie sound is so much more complex than stereo music. Movies have sound coming from so many directions, it may be more difficult to hear improvements in the noise floor. I also get a feeling that music via a system with good power conditioning sounds more natu-ral and less electronic, but this is more subtle than the noise floor improvement. The reason there are so many power transformer models in Torus Power’s portfolio is that you want to match your power transformer to your system and budget and to the electrical power grid where you live. The $20,000 SAE 2HP amplifier I reviewed recently had its out-put power rated at 2 horsepower, which works out to a little less than 800 watts per channel (though, the amplifier actually put out more than 800 watts per channel). This would be the type of amplifier that would come to life with 240 input voltage and balanced 240 volts for the output. But the amplifier draws so much current if you are using all the available power that you need a transformer in the Torus Power product that can deliver 40 Amps or more just for that one stereo amplifier. With the review unit rated at 20 Amps, it could still run that SAE amplifier as long as you kept the output power of the amplifier down to 300 watts per channel or so. That would keep the amplifier from wanting more current than the AVR20 can deliver. But it would be silly to pay for an 800-watt-per-channel amplifier then never use more than 300 watts. The well-written and well-illustrated manual made everything as clear as it could be. The manual even includes circuit diagrams and block diagrams describing the operation of the AVR20. The AVR20 has Torus Power’s network accessible user interface .With an Ethernet connection to the AVR20, you can monitor the amplifier to determine if everything is operating within expected parameters. The user interface allows you to establish a password to keep unwanted people from poking around. Once logged in you can view the status summary of operating parameters, turn the AVR20 on or off, and adjust settings to control how the AVR20 responds to lowor high power line voltage (stay on or turn off). If the AVR20 encounters a problem, it will send an Email to you or your installer/integrator. And you can do network configuration through the user interface. To access the AVR20’s user interface, you just enter the IP address of the AVR20 into your browser. The AVR20 is available in silver or black without rack mount ears or with a rack-mount faceplate. There are 10 individual power outlets on the back panel. Torus uses hospital-grade electrical outlets for their strong gripping force on plugs, and for the heavy gauge conductors that pass current more efficiently. The rack mount faceplate is 19 inches across, while the consumer version for placement on a rack shelf is 17 inches wide. The front panel has a power switch and a two-line text display. The text display is used to show the AVR20’sIP address or input and output voltages, or it can display error messages or other messages. You don’t want to under-size the power transformer if you intend to connect an amplifier to the power transformer. The back panel of the AVR20 contains the 10 AC power outlets, the 12 VDC triggers, the power cord socket (20A socket on AVR20 requires a 20A power cord), the RS-232 port, an Ethernet port, an input fuse holder, and a grounding lug should you need to use it to stop a ground loop. As far as I can tell, there were no power-line surges during the review period with the AVR20 in the system. The AC power line volt-age here ranges from 115 to 118 volts (so called 120 VAC would ideally measure 117 VAC on a volt meter that reads true RMS AC power), but there was one time while the system was in use that power noticeably dropped but did not shut off entirely. There was some clicking from the AVR20 immediately, and everything just kept working fine. Four or five seconds later, the AVR20 clicked again as the AC power came back to normal. So the relay board did its job of keeping the gear running, in spite of the short voltage drop. A peace of mind settles in after you connect everything to the AVR20. Subconsciously (I think), you are relieved of just a little bit of anxiety that could keep you from fully enjoying your fine system. There is something about knowing each component is protected from being damaged by a power line incident that lets me relax and enjoy the system more than usual. I have used power-conditioning equipment for a long time and only recently realized, when I intentionally connect equipment to “wall power” without conditioning, I get a little antsy. It’s way in the background, but it keeps me a little edgier than if the system was connected to a power transformer. If you begin your evaluation with movie sound, it’s possible you won’t notice anything, or it could be quite subtle. The sonic environrment in the movie brings so much ambient sound, it tends to mask power line noise. But if you know how to listen for a slight improvement in clarity, you will be able to hear it. I can hear it now, but it took years of trying to get to that place. Between the ambience and things moving around to different channels, you end up with an environment that is, at best, challenging. Stereo music is far more revealing of the improvement in clarity from removing most of the differential and common mode noise. Good recordings reveal the change, but really good recordings make it even more obvious. Familiarity with the recording also helps you make observations. You can’t ask for much more in a power transformer than you get with the AVR20, other than more current capability, if you have lots of amplifier power that needs power conditioning. Besides protecting valuable equipment from voltage spikes and power surges or sags,the AVR20 offers worthwhile improvements in sound quality, by removing noise from the audio signal, by providing the preamp and amp with clean AC power. If you insist on “more” in your power transformer, perhaps the AVR2 series would be a better fit for you.